Here’s the deal…Here are some before and after pictures of the leather seat cover install we did at The Seat Shop on Thursday, March 1, 2012. 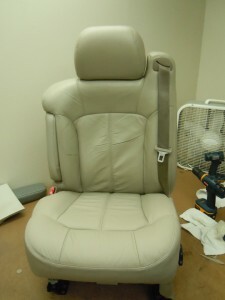 We replaced the Driver Bottom leather seat cover on a customers 2002 Chevy Tahoe. This Tahoe had the factory Shale leather interior color. 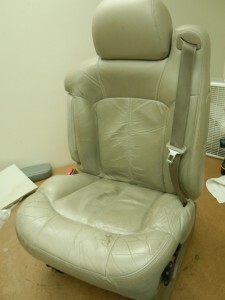 The seat top, headrest, and armrest were not replaced. They are the original factory pieces that we just cleaned using The Seat Shop’s cleaning method (shown here). This seat was extremely dirty. After we cleaned a few panels, we took a picture just to show how dirty the leather covers can really get. Cleaning the seats will take off the “shine” that accumulates on the seat covers over time from dirt, oils on your skin, etc. The new leather seat cover will not have this shine, so make sure you scrub the seat to get a perfect color match out of the new cover. (Notice the difference in color and “shine” between the cleaned and uncleaned individual leather panels in picture #2). We also replaced the driver bottom foam cushion with a new OEM one. The density of the new foam cushion will help the new leather cover last a whole lot longer, as well as increase the comfort level for the driver. Check out these pictures of the new bottom seat cover, as well as how well the old top cleaned up! 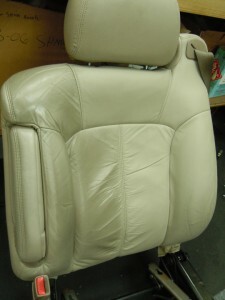 If you have any questions about factory match leather replacement seat covers, or new OEM foam cushions, feel free to give us a call at 214-710-2565 or visit us on the web at www.theseatshop.com. We are always happy to help!